US, 2011, 110 minutes. Colour. Russell Brand, Helen Mirren, Greta Gerwig, Jennifer Garner, Geraldine James, Luis Guzman, Nick Nolte, Evander Holyfield. It’s thirty years since Dudley Moore was the cheerful, alcoholic ne’er-do-well, Arthur, the New York billionaire. It’s thirty years since John Gielgud’s Oscar-winning performance as Arthur’s butler and nanny, Hobson. No reason, not to have an update. Russell Brand. After making his name as a comedian, Russell Brand has been appearing as an actor in films as diverse as Get Him to the Greek and The Tempest. He gave his voice for the central Easter Bunny in Hop. Generally, he sounds the same, a distinctive British accent and tone that often can get away with humorous murder. He uses it again in Arthur, but there is much more in his performance. In fact, there is quite an amount of nice romanticism and sentiment in this version of Arthur. Brand has no difficulty in showing the irresponsible and indulgent side of Arthur. But, he is also convincing in showing an underlying intelligence (which he hasn’t bothered developing) and the change from philandering nitwit to falling genuinely in love as well as showing a kindness to Hobson who (after her change to Prospera in The Tempest) is now played by Helen Mirren, Arthur’s devoted but not exactly no-nonsense nanny. Arthur’s mother – a steely performance by Geraldine James – has had little time for her spendthrift son who embarrasses her no end. She offers an ultimatum: either he marry the ambitious Susan (Jennifer Garner) or be cut off from his inheritance. By chance, he encounters Naomi (Greta Gerwig), an illegal tour guide at Grand Central Station and is charmed and then falls in love. Will he marry and keep the money? Will Susan’s father (a gnarled Nick Nolte) threaten him with his electric saw? Could his mother ever change her mind? Could Naomi really return Arthur’s love? Russell Brand is always good at one-liners or toss-away funny and ironic lines and there are plenty here to keep the audience amused and on-side. Helen Mirren clearly enjoys herself being strict, being indulgent, commenting waspishly on Arthur’s behaviour – and instructing him how to make tea with a teabag. Luis Guzman is Arthur’s amenable chauffeur (even to dressing as Batman and Robin and driving a batmobile). And the NYPD shows amazing tolerance and understanding. Greta Gerwig has the difficult job of persuading us that Arthur is worth loving despite his fickle past. She does it very nicely and makes Naomi a pleasing, ordinarily down-to-earth character. And Arthur’s drinking and resolutions. After a failed AA meeting where Hobson strongly but gently chides him, he offers non-stop comment on his progress. And then, final credits and a new version of Arthur’s theme that won the Best Song Oscar way back then. 1. The original and its impact? A remake? Updating? The same issues and the differences? The strong cast? The Oscar-winning song – and the variation during the final credits? The homage to the original? 2. A New York story, the business world, the life of the wealthy? The contrast with ordinary people? 3. The city itself, the skyscrapers and the streets, the wealthy atmosphere? The world of greed? Offices? The contrast with ordinary homes and streets? Grand Central Station? The realism? 4. 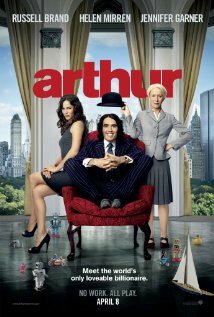 The blend of realism and surrealism, in Arthur’s character, behaviour? The film as a fable? 5. Russell Brand, his appearance, accent, behaviour, humour, one-liners, throwaway lines and humour? Arthur’s character, development, change? The feeling and sentiment? 6. Helen Mirren as Hobson, British, the British nanny, her back-story of her love and the death of Arthur’s father? Her staying for thirty years? Responsibility, caring for Arthur, spoiling him, correcting him, her ironic and caustic comments? 7. Vivienne, her neglect of her son? Her dead husband? Her inability to embrace Arthur, shaking hands with him? Her social life, her business life, the chancellor and the deals, the social event, her embarrassment, her ultimatum to Arthur? Forcing him to marry Susan, the engagement, the photos, the wedding scene? Her change of heart and Arthur’s stance? 8. Arthur and his life, his work with his chauffeur, Bitterman? The opening, the Batman uniform, Bitterman shaving for Robin? The Batmobile, driving through New York City, the lenient police? The photos, the headlines? His releasing everyone from jail, giving them money? His generosity, his spending? His womanising? Childish? The girls in the apartment, the girl stealing his watch? His reliance on Hobson? Going to his mother, his reaction to being cut off, his dislike of Susan, the dinner sequence, the carry-on in the restaurant, Susan making him propose on his knees, Susan and her drinking, coming to the house, the bedroom scene and the magnet under the bed? The poses and the horse-riding and threatening Arthur? Arthur’s visit to Burt, the episode with the saw, Burt’s threats? The fittings with Susan? His not loving her? 9. Arthur and Hobson, their ease with each other, talking, she correcting him, at the boxing ring with Evander Holyfield, her punching him? The issue of Naomi and Susan? Hobson’s illness? Her going to visit Naomi, more sympathetic? Hobson in bed, the television and the bears, Arthur and his gift of the toy bears? Arthur learning to make tea with a tea bag? Hobson’s range of dying words? The quietness of her death and Arthur’s grief? 10. Susan and her ambition, her background, from Pittsburgh, her self-made father, wanting to control the company? The wedding sequence, her punching Arthur, being jilted? 11. Burt, self-made, ambitious, the saw, the photo poses, the wedding, congratulating Susan on her punching Arthur? 12. Naomi, bright, ordinary, the tour of Grand Central Station, lying on the floor with her tourists, explaining the stars and the art, Arthur joining her? The police, her having no licence, moving her on, getting the money to look after her father? Arthur and his explanations, emptying Grand Central Station, the dinner, the waiter? Susan and her reaction? Naomi’s story, her life? Arthur visiting her, able to talk, not able to tell her the truth, his drunkenness, upset, telling the truth to Naomi? Encouraging her to publish the book? Susan revealing that he had bought the book company? Hobson’s visit to Naomi, Naomi taking her to the hospital? 13. Naomi and her writing the book, the success of the publication, the signing, her reading the story to the children, the questions, Arthur’s question? 14. The wedding sequence, the fanfare, everybody dressed, Arthur and Bitterman? His going to the wedding, not being able to follow through, stripping, running through the street, Bitterman driving him away? 15. The Alcoholics Anonymous meetings, Arthur not wanting to say anything, being depressed, Hobson and her story – voicing Arthur’s own experience? The effect on him? The later visit to the AA – and Arthur telling his story at great length? 16. A story of true love, true wealth and poverty, a fable in New York City?